A meta-analysis of nature/nurture research. Harris claims there’s no proof that parents enjoy more than a genetic influence on how their kids —turn out.” It’s the children’s peers, instead, who exercise the larger influence on them in their daily lives, reports the author, a self- styled nonacademic who says she was booted from her Harvard Ph.D. program—but who’s since written college textbooks and journal articles on child development. 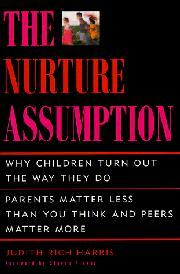 Increasingly skeptical of the material she—d been including in her own textbooks, Harris began questioning and reviewing child-development studies with particular emphasis on “socialization research.” This corner of the field theorizes that parents determine the “entire course of their [children’s] lives.” This is what Harris calls the nurture assumption; she devotes the next 400 pages to disputing it. She asserts that evolution demands children find their way quickly into groups and that, by the time they—re toddlers, they—ll be shaping their own behavior, whether formally or just in fun, based on that of their peers and of older children. Harris gleefully attacks various child-development icons (John Watson, Carol Gilligan); surveys the truths offered both by literature (Lord of the Flies) and primate research; and often cites a saying that emphasizes the power of social disapproval: “The nail that stick up gets hammered down.” She defends parents who treat their different children differently, contrasts one-on-one relationships and “group culture,” and offers some not very optimistic thoughts on—and tentative defenses against—delinquency and racism. While Harris warns that “parenting has been oversold,” she also includes many personal anecdotes about her children and her own childhood, which sometimes has the effect of diluting the impact of her message. This poses an important challenge to the mounting pressure on parents that decrees they alone can guide the character and accomplishments of their children.